Around here you're probably used to reading book reviews and not much else. Well, today we have a surprise for you! The cats received a special box in the mail and they couldn't wait to try it out and to share their opinions with all of you. 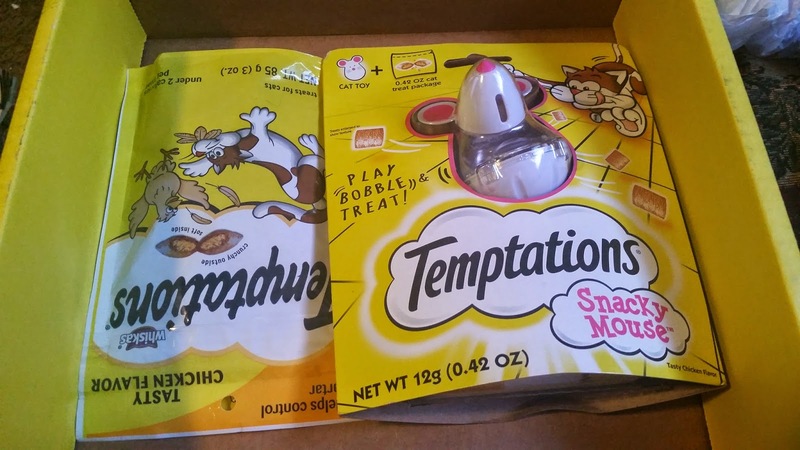 Opening up the box, we discovered this cute toy and a pack of cat treats! The cats were all about just diving into the treats, but I held them off long enough to add some of them to the toy itself. Since the picture doesn't make it totally clear, the mouse's head unscrews and you pour the treats in. I do suggest that you cover the bottom holes as much as you can. Otherwise, you end up with a lap full of cat treats...and then cats... Once it's filled, simply put the head back on and place the toy on the floor. As the cats swat it around, it rolls about (think weeble people for those of you as old as I am) and dumps out a few treats at a time onto the floor. My cats mastered this quickly and after that, every time I entered the bathroom, they were requesting that I add more. The one night that I didn't, they decided to tear open the treat bag and eat all of the treats! So, overall, this fun little toy was a total success and one that the hoard here will enjoy for ages to come. Now, since I rarely post pictures or even video of the kitties, Dorian insisted that I show off him demonstrating the toy to Mittens... Enjoy!